Two weeks ago, the City of Seattle hosted its annual Emerald City ComicCon (ECCC) at the Washington State Convention Center to the delight of comic book fans in the Pacific Northwest and the event’s international attendees. Comic book conventions are places where the imagination can run wild. At conventions, comic-art—even in the form of costumes—is inescapable. Cosplayers dress up in attire dawned by iconic heroes and villains. They join other comic-clad patrons for the similar goal of taking part in the commerce, often debating with their friends over comics and toys, cruising around the floor while people-watching, and meeting their favorite comic book creators. Writers, artists, editors, and more await patient people who wait for the chance to land a five minute “thank you” and a possible autograph or photo opportunity. Tom Taylor is one creator who wasn’t amongst the creative community at ECCC in 2017. Originally scheduled to attend, Taylor canceled his appearance days before the convention due to his feelings on the state of immigration in America. In particular, President Donald J. Trump’s Executive Order on the safety of the country’s “interior.” Taylor, a native of Melbourne, Australia, fears that—due to these new “enhancements” of the safety of America—he’s not “safe” or “welcome in this country.” Currently, Taylor is the scribe of comic book titles for both Marvel and DC Comics—a rarity for writers in 2017’s comic book industry. Marvel’s All-New Wolverine and DC’s Injustice: Gods Among Us—both penned by Taylor—are top-selling titles. Taylor continues to make a tremendous impact on the comic book landscape. Unfortunately, his fans missed out on the experience of meeting the talented writer at the ECCC ’17 events. 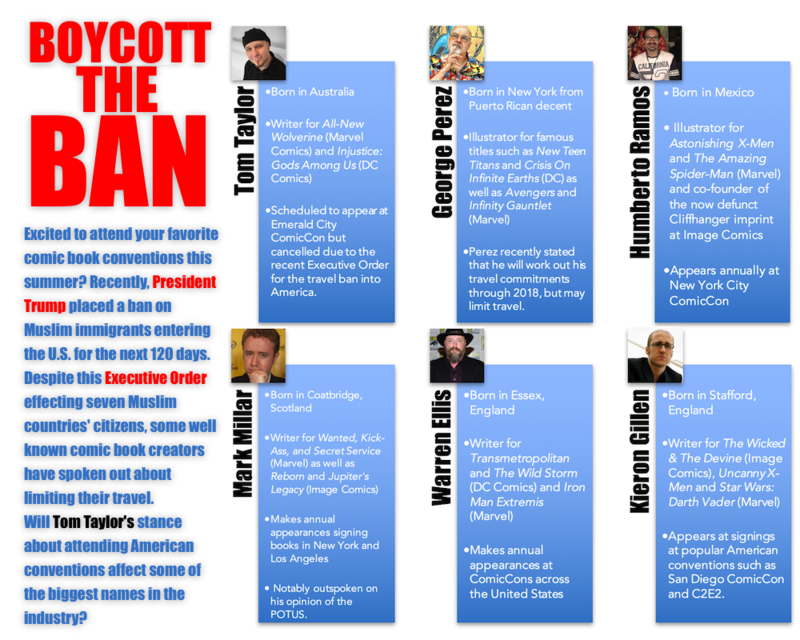 Taylor joins a few other creators who are taking similar a stance against the President’s Executive Order. However, Taylor may not have looked deeper into the City of Seattle—namely King County. The Mayor of Seattle, Ed Murray, recently challenged the authority of Washington, D.C.’s lawmakers and their federal agents’ involvement in enhancing U.S. immigration limitations. According to the Seattle Census Bureau, over 600,000 people live in Seattle, of which over 33% are minorities/immigrants. Murray wants the city to continue its reputation of being a welcoming community. The Emerald City recently made a request to obtain public records in order to gain more knowledge about how the new immigration laws in cities with high foreign populations will work. Mayor Murray and Tom Taylor likely share similar beliefs, as do comic book fans in touch with the country’s political climate. It is unfortunate that Taylor was absent from a convention in a city where its leaders are willing to verbally stand up against the President’s recent Executive Order. With other comic book creators also refusing to travel into America, what does this mean for the future comic book conventions within the United States? Will Taylor’s perspective set and example for other comic book creators to follow?